How is it that I have been traveling on missions trips for 10 years and I still learn something new every trip I make? You would think after all this time I would be an old pro at traveling. My excitement for leaving the country this summer cannot be overstated. I looked forward to seeing friends I made last year, reliving old experiences and making new memories. I always assume God is going to teach me something on the trip, maybe through the kids we work with or on our team from the US. God had other plans this year and my training began early when I was denied an exit from the US due to my passport being three months shy of expiration. Long story, but I spent three extra days in Miami trying to get a new passport. My biggest question was, “Why God? !” followed by many exclamation marks. I know God does things for a reason but this seemed absurd. The first week in Ecuador is spent in the Capitol City of Quito. Our team taught at the church Iglesia Inaquito in the morning with kids, who for the most part go to church with their families and have the benefit of a spiritual influence in their lives. Those of us who were returning reunited with translators and kids we had met the year before. It was refreshing to see so many familiar faces and to be hugged over and over again by kids that remembered us or just wanted a hug. In the evenings we did the same VBS style program we had in the morning with kids on the outskirts of the city. These children do not all have the benefit of good influences in their lives and you could tell they were hungry for attention and listened closer than the morning crowd. These kids needed more love and our team showed it to them. The end of the week brought goodbyes, which are always tough, but we knew we would see some of these kids at a camp where we would work two weeks later. The weekend brought some sightseeing and a well-deserved 12 hour vacation. We took the team to a mountain town where we stayed at a very nice hostel owned by native Ecuadorians. Shopping was in order and some sleep. The latter doesn’t happen so easily with a team as full of energy as ours. One 6-7 hour bus ride later found us beginning week two in Esmeraldas, a coastal city with 48% unemployment. Approaching this city I felt a need for the gospel to be spread and for God’s Spirit to work. Our days were spent in the schools and at a local orphanage that our host, Pastor Louis, has developed relationships with. Pastor Louis and his wife are the sweetest couple and their love for their city is evident. The temperature is hot and humid on the coast compared to Quito where the average high was 65 degrees during the day. Many showers were taken throughout the day as we went to and from our hotel to regroup for each trip. So much could be said of our trip to Esmeraldas. We visited a little area called Roca Fuerte one of the days we were there. I must say this was a highlight of the trip for me. This small town has very little Christian influence and its occupants are very poor. The children are blessed to have a pastor from the church in Esmeraldas come and work with them throughout the week. We visited last year and it was a blessing to see the progress he has made. They are building a school house to begin teaching these children. There were between 250 – 300 children by the time we ended our program, many of them without shoes or adequate clothing. Tears fill my eyes remembering their faces and the way they clung to us as we tried to leave. Many of our teams had 25-30 kids on them which can get crazy, especially if you are a game team! We visited an orphanage one of the days and it was definitely another highlight. Last year I met a little boy there who had eight brothers and sisters all orphaned since they were very young. He and one sister were the only two who had somehow made it to this orphanage. Many of the kids come and go so I knew seeing him would be iffy. But, he was there and we were reunited with laughing and making hand motions (the price of not speaking each other’s language). When we were preparing to leave he looked at me and said, “When will I see you again?” I smiled choking back tears and confessed that I did not know. But, I told him I would come back even if it took another year. During the evening I was tasked with leading the youth program. I was less prepared than I would like to have been. But the amazing thing is that God worked through my lack of preparation and my hesitation. These young people listened and responded to each speaker that shared from our team. I am grateful for Elizabeth Fox, Danny, John and Daniel (my brother) who each brought from their hearts a message to these youth. The message of the gospel went to them and I pray it finds its mark! The last week we traveled to Same Beach for my favorite part of the trip, camp week! 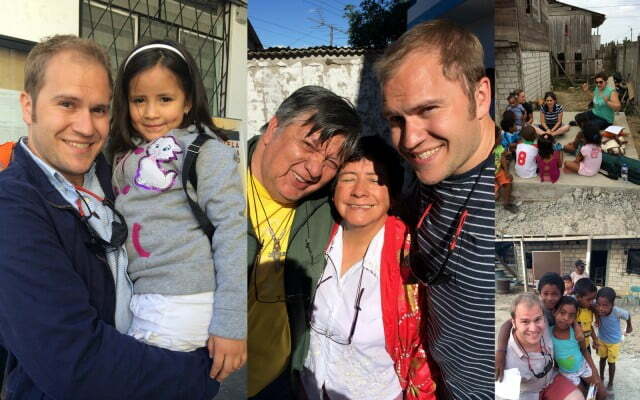 We are reunited with many friends from the first week in Quito. This year we did a world cup theme and the kids loved it. I believe it is most Ecuadorian kids dream to one day play professional soccer. Camp is special because we spend all day and night with the kids. They are split into teams and win points together throughout the week that will add up to 1st through 3rd place awards at the end of the week. What a year at camp! We had kids ask how to know Jesus and truly saw their hearts change. During line up (which is always fun, I blew a whistle and mayhem would ensue) Ashley Dickson, one of our team leaders, came running over crying. She said that Denise, one of the little boys on her team, had trusted Christ for salvation. In perspective, this little boy was a trouble-maker and not the one you would go to for laughs during the week. We had to work with him one on one, on more than one occasion. But he spent time with Sammy our translator and asked so many questions about God. But to hear him say the words “Jesús está en mi corazón” (Jesus is in my heart) brought a smile to my heart and caused me to thank God for using this team in the lives of these kids. Goodbyes to best friends are the hardest things in the world, especially not knowing if you will meet again. Our team, energetic group that they were, invested so much love into the kids. When we returned I was asked by the dad of one of our team members to tell him one thing that stuck out to me about this trip. I told him I have never worked with a team where everyone gave 110% of their heart and passion to the kids. 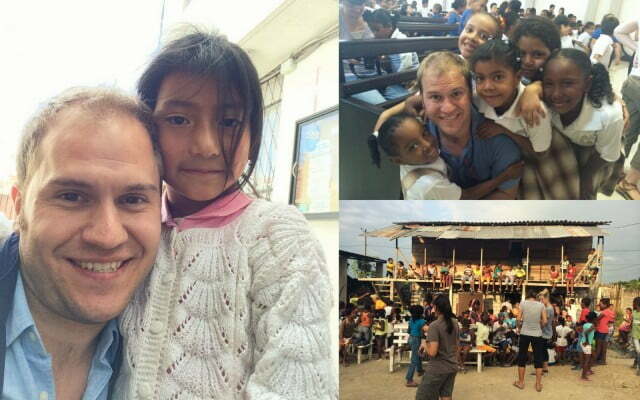 It was a blessing and so refreshing to be a part of Ecuador 2014. I have left out so many stories and parts of this trip that I could tell but for the sake of length I will close. I hope you have made it this far in my writings. If you are still reading this I would have you know that God is doing amazing things in Ecuador. I know He is working around the world but I haven’t been to every part of the world so for now I will tell you about Ecuador. Something happened to me the first time I went and a piece of my heart will always be there. I love the people, the food and the culture. Most of all I love that God chooses to take broken vessels that leave the comfort of their homes, go to share, teach and affect the lives of people in other countries and find their lives forever changed. I am grateful for Pastor Benjamin and Rosita his wife who have become such close family! (My Ecuadorean family.) We would never make it without them. I miss so many, especially little Melany who became such a close friend last year. Being reunited with her was another highlight of my trip! I know I will go back and I look forward to continuing to be a small part of what God is doing in the world for His Glory! Oh yes! You should take a short term missions trip, it WILL change your life.